On Friday, February 9, you'll get all the fanfare you can handle at the 2018 Winter Olympics Opening Ceremony in PyeongChang. There will be songs, rings, flags, that greased-up dude from Tonga, and probably something about peace since that's the theme of this year's opening ceremony. Because there is a 14-hour time difference between PyeongChang, South Korea and the eastern seaboard of the United States, some events will be carried live on TV, but many will take place while you're sleeping. The Opening Ceremony isn't one of the events you'll be able to watch live on TV. But that doesn't mean you can't watch it live. Though the first events take place on February 8, the Opening Ceremony at PyeongChang Olympic Stadium takes place February 9. NBC will carry the pageant live, but it'll be taking place at 6am EST. The only way to watch it live will be streaming the event on NBCOlympics.com or the NBC Sports app. You can get the app on your computer, mobile devices or set-top devices like Roku, Apple TV, and Amazon Fire TV. If 6am makes you scream internally, you can watch athletes walk and wave when NBC rebroadcasts the opening ceremony in primetime at 8pm EST on NBC on Friday night. 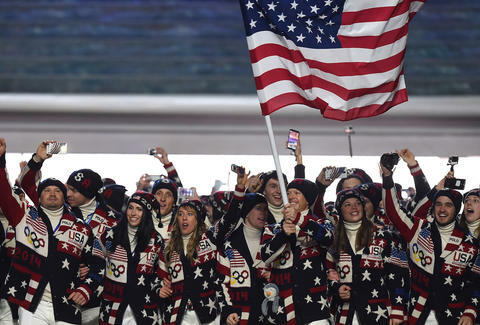 Then get ready for non-stop sport, because NBC is set to broadcast a record 2,400 hours of Winter Olympics day and night until the closing ceremony on February 25. As always, the opening ceremony will be a huge spectacle and opportunity for the host nation to showcase its history and culture. In the US, the broadcast will be hosted by Mike Tirico and Katie Couric, who is returning to NBC for the Olympics. Tirico, who is best known for his work doing play-by-play on Monday Night Football, will be covering his first Olympic Games. On Wednesday, Team USA announced that Erin Hamlin will be the flag bearer for the US. In the last Winter Olympics, she became the first-ever American to win a medal in singles luge. After that, the only sport the US has never medaled in is biathlon. The US will appear near the end of the parade of nations during the opening ceremony. Traditionally, nations march in alphabetical order with to exceptions. Greece goes first and the host country goes last. That finale will be especially charged this year because South Korea and North Korea have announced that they'll march together under a unification flag. Oh, and there will probably be fireworks. Everyone loves fireworks.